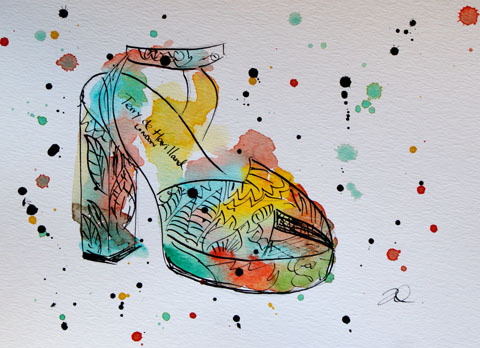 Multi-disciplinary artist Tiff McGinnis has created super colourful surface patterns for the new S/S 2013 Terry de Havilland shoe collection. Terry de Havilland S/S 2013 collaboration with Grande Dame by Adam Pryce. After over five decades in the business iconic shoe designer Terry de Havilland is still creating fantasy footwear to please a host of celebrity fans. For S/S 2013 he has taken inspiration from his 70′s glam rock roots, collaborating with long time friend and visionary multi-disciplinary artist Tiff McGinnis. The collection has been shot by photographer Sarah Piantadosi and features flame headed model de jour Codie Young. I spoke to Tiff McGinnis, aka Grande Dame, about the project. How did you and Terry first meet & decide to work together? It seems quite a coup! I first met Terry & his lovely wife Liz 11 years ago. I had just recently moved here for NYC. Liz was a fan of my dear friend & publisher – Tim Love Lee – and had invited him for dinner with the stipulation he bring a guest, and he brought me. We hit it off from day one and have been good friends ever since. Over the years, Terry & Liz followed my work in animation & illustration. We casually discussed collaborating, then last year they approached me on doing this one off collection for S/S 2013. It went so well, I did an A/W collection as well; and am pleased to say that I will soon be working on 2014 designs! Terry de Havilland S/S 2013 collaboration with Grande Dame by Isher Dhiman. What was the process of putting these shoe designs together? The shoes are real showpieces. How do you hope they will be worn? Anyway someone wants to wear them is fine with me!! More importantly I am thinking how I will wear them!! My royal blue silk dress will go perfect with the blue Isis & Blue Tiffany! My purple wrap will go great with the yellow & purple Tiffany. My gold leather trench coat will look fab with the Gold & Mint Isis, as will my red crepe dress. And I am picturing my full length black Halston dress with the totem’s and lots of turquoise and silver jewelry!! This job is a total dream! I have been very spoiled over the years by Terry, luckily the only model size I have on my body are my feet!! When I am wearing his shoes I feel like the ultimate goddess! Ha Ha! The architecture of his designs are amazing! They elongate the leg, and shift up the derriere, posturing the body to total sexiness! So, to be working together with him is just totally beyond amazing!! Tiff with some of her other artwork. You have recently moved from London down to Hastings – how are you finding it? Totally loving it: I lucked out and found one of the most beautiful flats on earth. A palace on the sea! Literally. Totally out of an Agatha Christie novel. Everyday I wake up and feel like a movie star. It’s so gorgeous here, and inexpensive. So I’m staying for good! 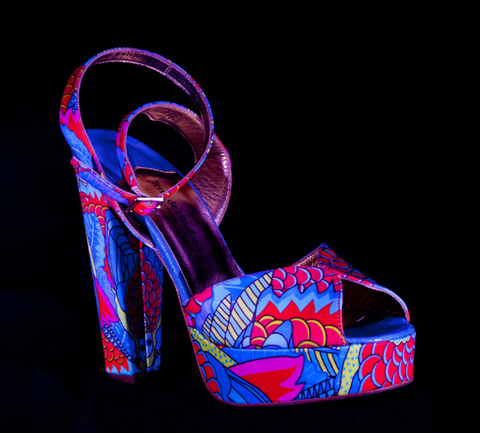 Other shoe designs from the new S/S 2013 Terry de Havilland collection. As you know I am a big Grande Dame fan, what other projects have you got in the pipeline? Read more about Grande Dame in my article about her gorgeous porcelain plate designs. 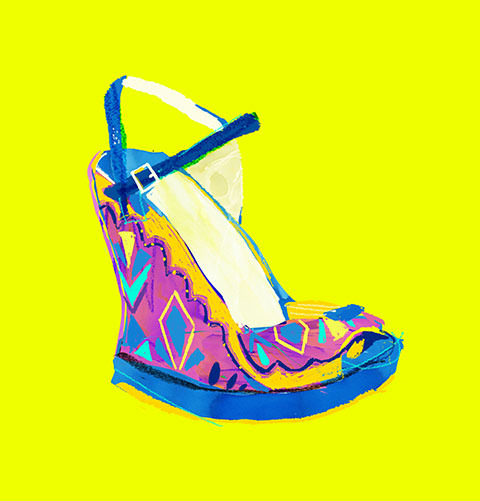 These shoes are so beautiful, I love a good wedge too! I think the illustrations are lovely, really full of fun and energy.